It’s always important to do your research before undergoing any sort of cosmetic procedure. After all, this isn’t the same as having a particularly dramatic makeover. Plastic surgery is an invasive procedure which has a very real impact on your body and shouldn’t be taken lightly. 26-year-old Chloe Khan rose to semi-fame during the 2010 series of The X Factor, back when she was known to fans as Chloe Mafia. With her super-long hair and skimpy crop tops, the Wakefield lass certainly stood out from the other contestants and has been experimenting with her appearance ever since. Glam Chloe has always been open about her passion for plastic surgery, which has led her to boost her breasts up to an astonishing 32HH. She has also endured several nose jobs as well as lip filler treatments. 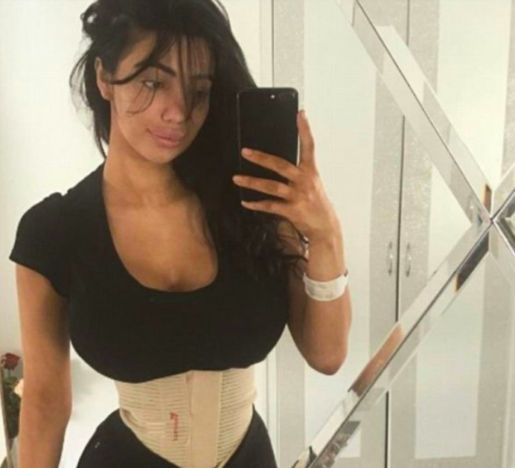 Some of her procedures are rather unusual, including a Brazilian Input Lift which left her waist noticeably blooded. From what I can gather, this gruesome operation involves having unwanted fat sucked out before being injected back into your bottom. Ouch. Now the reality TV star has given a dire – and very visual – warning to fans who might want to follow in her plastic-fantastic footsteps. 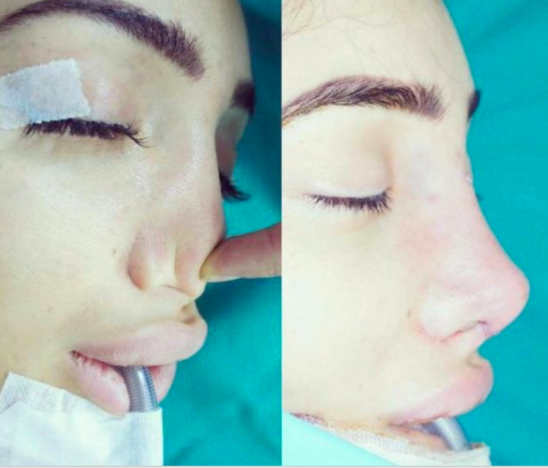 The model and media personality shared images of her corrective nose surgery, encouraging those who are considering going under the scalpel to find trustworthy practitioners. This is not a glamorous post but I have had so many DMs asking where I got my nose done. I wanted to be open with you all. On Halloween I went to @elitecosmeticsurgery. My nose was absolutely destroyed and I had NO BONES IN MY NOSE! I didn’t need a cosmetic surgery I needed to have a full reconstruction with 8 graphs [sic] from my ear cartilage. He ended out being a fraudster conman and nobody believed me how bad it was. This is why I’m sharing this to make sure everyone has the knowledge of a safe surgeon with amazing results. Thank you so much @elitecosmeticsurgery you have changed my life. The disturbing split image shows Chloe lying on the operating table, under anaesthetic. In the ‘before’ image, the doctor is pushing down her nose to demonstrate the unnatural lack of septum. In the ‘after’ image, we can see how the shape of Chloe’s nose has been fortunately restored through the clever use of ear cartilage grafts. Personally speaking, I would always advise a friend to try and love – or at least like – their own unique appearance before going under the knife. Like lots of people, I have experienced insecurities over my facial features but have felt much happier after learning to focus my thoughts on other matters.
? @ryanstrades and his team are smashing profits on forex trading! Give him a follow! They’re currently offering 20 more spaces on the FREE apprenticeship learning basics on trading and following their own trades to profit! They currently has over 1500 clients in the apprenticeship at the moment, teaching them the basics and giving them trades to follow to make profit! Average clients profit last month was £500-£700 following their trading tips! ? check out the client feedback uploaded daily! No experience needed as they show from the basics on how to follow and what everything means. If you're interested in getting involved in the FREE trades/apprenticeship then give them a follow and drop them a message and he will get back to you with details ? ) ?? However, if you have already made up your mind to turn to surgery, then make sure to do your homework and don’t take any risks. Endangering your health just isn’t worth the minuscule difference in the size of your nose.